There’s a lot to be said for elegance and subtlety. And there’s also a time and place for going completely over the top. 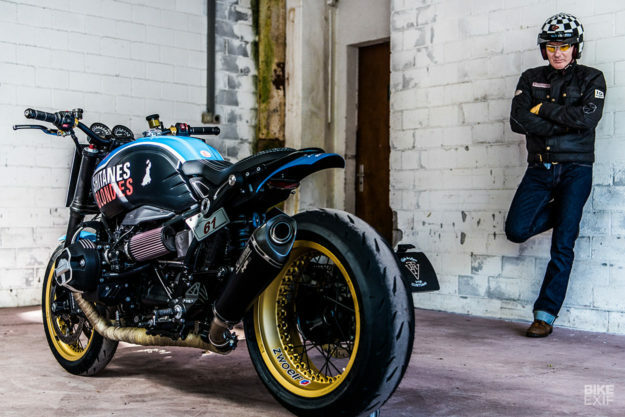 Dani Weidmann and his crew at the Swiss shop VTR Customs can play it both ways. 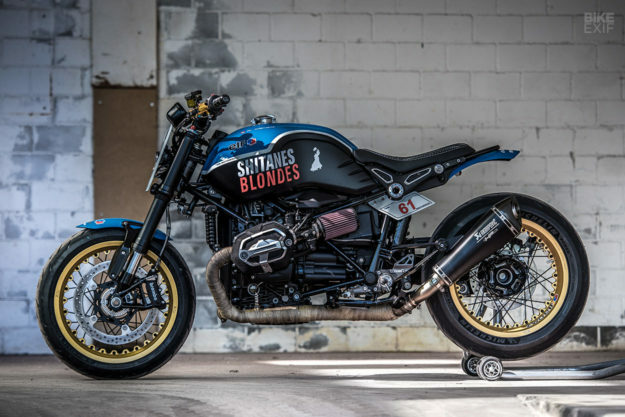 This time, they’ve turned the volume up to 11 and built a BMW R nineT that’s about as subtle as an AC/DC riff. 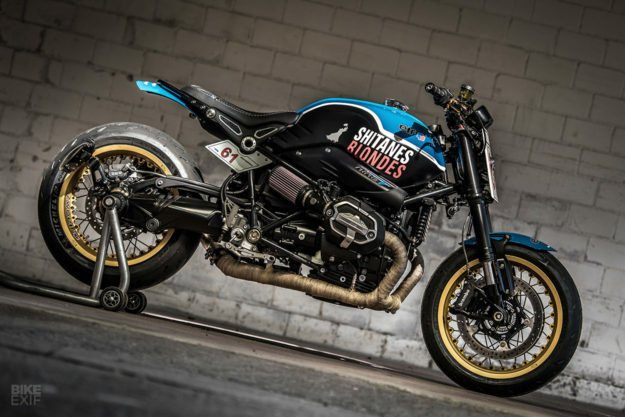 It’s got 136 hp, a stonking 145 Nm of torque, and it’s called ‘Shitanes 61’—a reference to the famous Gitanes motor racing livery from the 1980s. 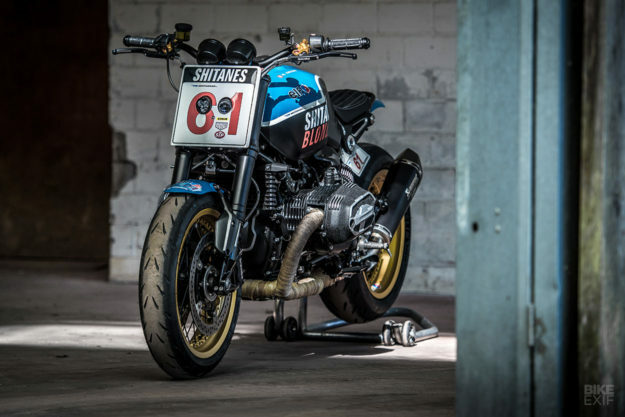 The story starts at the last Swiss Custom Moto Show, where VTR displayed their R nineT Pure ‘Street Tracker33’ bike. It was snapped up on the second day of the show, much to the chagrin of one of VTR’s regular clients. 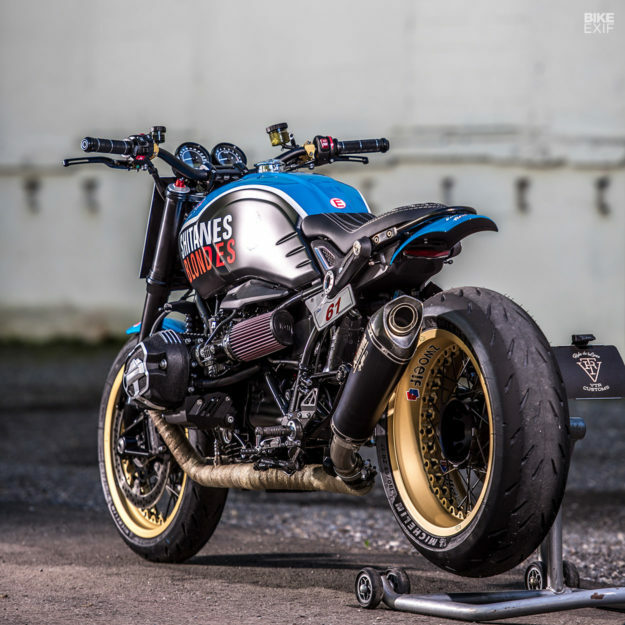 The concept was agreed on the spot: an R nineT with USD forks, engine tuning, a quickshifter, top shelf high performance parts, and a dash of 80s style. “That’s doable for us, because we grew up around that decade, and have done 80s theme bikes in the past,” says Dani. While kicking ideas around during a coffee break, talk turned towards Formula 1 cars. 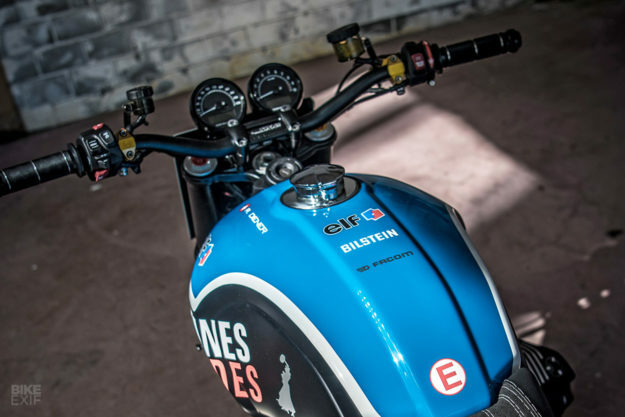 “We came to the Gitanes design [used on the French Equipe Ligier cars] and voilà—Shitanes was born.” The #61 comes from the owner’s year of birth. 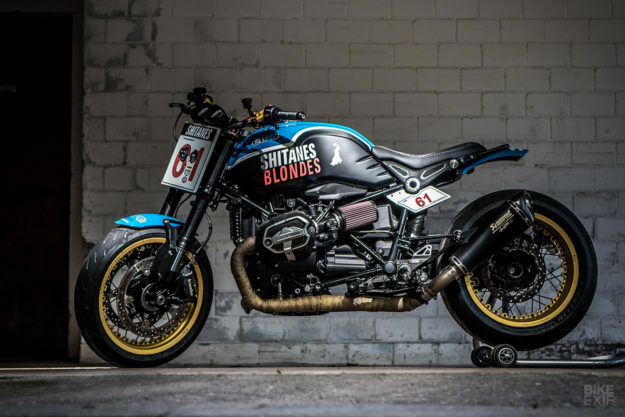 For the donor bike, VTR chose an R nineT with the Option 719 accessory pack—which includes goodies like milled cylinder heads, upgraded foot pegs and adjustable brake and clutch levers. But to get the 80s look, VTR decided to have the Spezial parts ‘shrink coated,’ as Ferrari cylinder head covers are. It’s the engine that’s really the centerpiece of this build, though. It’s been bored out to 1320 cc (80ci) using new high compression pistons, cylinder liners and connecting rods from Wössner. VTR have also reworked the cylinder heads for better airflow, and installed a Power Commander to get the mapping right for the modified engine. The dyno sheet now shows 136 horsepower, a 23% increase over the standard 110. 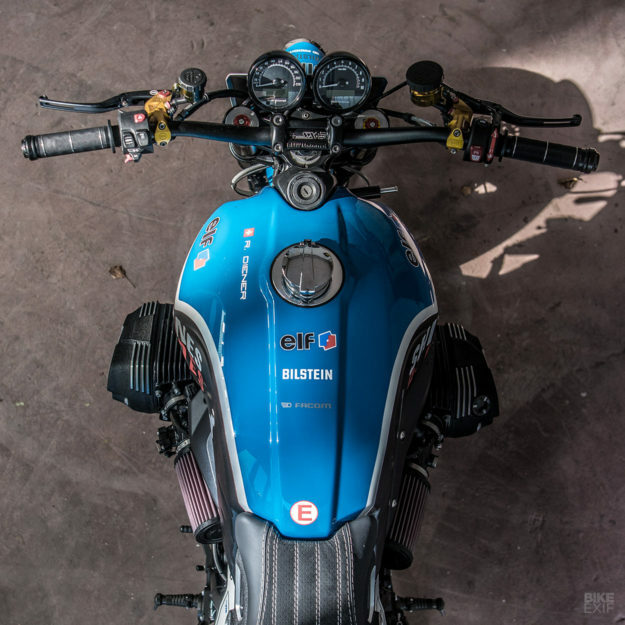 “It’s a beast,” says Dani, and we bet it sounds like one too: gases now exit via a straight-through Akrapovič titanium race exhaust system. 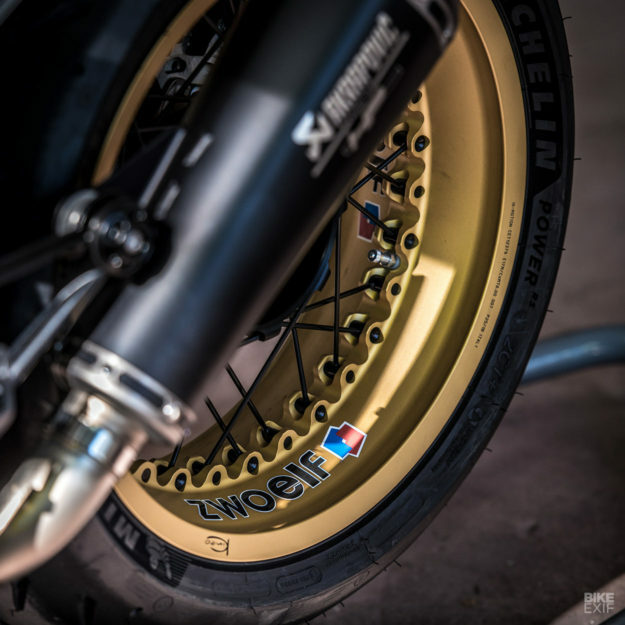 Grip will be plentiful thanks to Michelin’s race-bred Power RS slicks, which are wrapped around 17-inch Kineo spoked wheels—a hefty 6 inches wide at the back, and 3.5 at the front. Bobbed fenders keep the crud away, and VTR also fabricated the alloy front and side alloy number plates. The tank is stock but the fuel cap assembly has been modified to accept a Monza-style cap. The cockpit has been given an upgrade too, with the standard bars swapped out for a lightweight Magura SX bend. Magura also supplied the high-end HC3 radial master cylinders and VTR have added tinted green glass to the stock twin instruments. 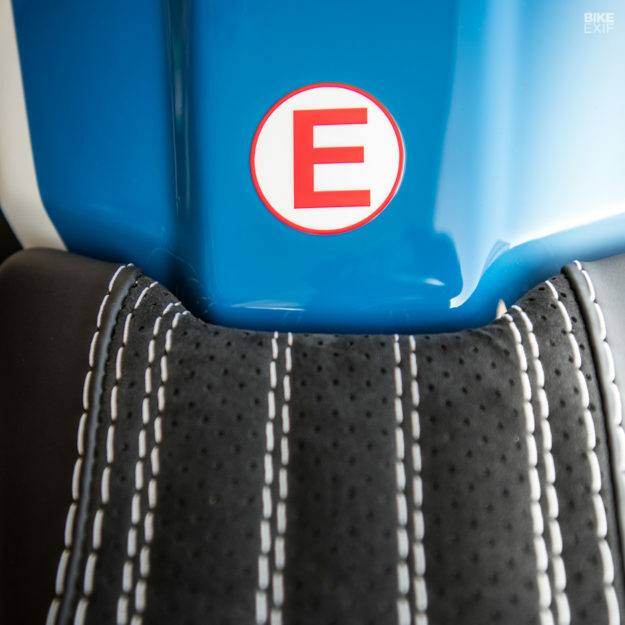 Sitting atop the shortened rear subframe is a new seat pad, stitched in classic 80s style and made with the help of Carrosseriesattler Yves Knobel. Tiny multi-function taillights from Kellermann are only just visible—if you know where to look. The Gitanes-style paint was applied by VTR’s regular spray guys, Freuler of Benken. And there are a few logos from the 80s scattered around too—some of them discreetly subverted. 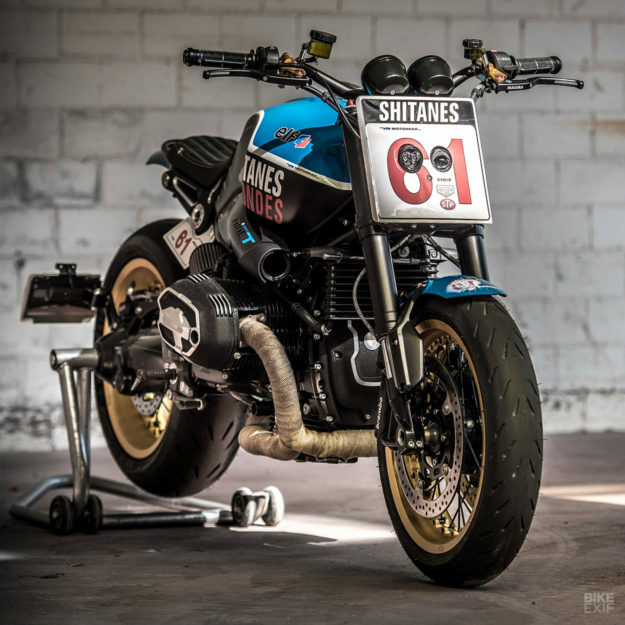 So it looks like Shitanes 61 will forever be a one-off. But the good news is that VTR’s order book is open. If you want something a little different, and a guaranteed one-of-a-kind too, you know who to call.